I used to backpack in college a zillion years ago and just in the last few years have backpacked some private trails in Tennessee, Missouri and most recently South Carolina. I have been an avid car-camper for twelve years and I have kayak/canoe camped for five years, both in South Carolina, Tennessee, Missouri and Arkansas. I use a lot of the same equipment for both. I hike hilly/rocky trails especially in Missouri (my home state) and Arkansas. I live in South Carolina and am busy checking out the terrain here with my seventeen year-old son. The Big River Dry Bag came to me in an envelop with the dry bag in a plastic tube. The tube advertises "2 Hypalon lash loops for secure attachment or stacking" and "a Waterproof Hypalon roll top closure- does not wick moisture." Hypalon is a synthetic rubber created by DuPont that is noted for its resistance to chemicals, temperature extremes, and ultraviolet light. The seams are reinforced and double stitched. The instructions say to roll the bag at least 3 times and latch to close. I was expecting something BIG, hence the name, but the 13L bag is much smaller than I expected. What I did notice though, was how sturdy the bag is. The material seems very durable. I also like the nice bright red/orange color. It should make finding the bag easy. I like the lash loops on the side a lot. They look strong and durable and should come in hand when lashing it to the top of my kayak. When I purchase a dry bag, when I get home, I immediately put something in it and then put it under the shower. This time I put a camp pillow in it. The closure works like every other dry bag I've used. I put the material inside, rolled it three times and latched it. I ran the shower over the bag while the bag was standing up so that the water ran over the closure. This bag performed beautifully. The pillow was absolutely dry after letting the water run over it for a minute. Also, the water beads up on the fabric and I could shake most of it off. The oval base does seem to make it easier to stand upright as long as there is something heavy in the bottom of the bag. With just a camp pillow in it, the bag fell over. This seems to be a very durable dry bag. I will treat it pretty roughly, like I treat my other kayak/camp gear. I will use it for smaller items like a change of clothing. It is too small for my winter sleeping bag. I will also try to use it while biking to work in the rain. The bag seems very durable. I like the lash loops. It is kind of small. I have used this bag on two kayak trips and one rainy camping trip this test series. Both kayak trips were in the salt marshes/oyster beds near Myrtle Beach, South Carolina. One was overnight and the other a day trip. The temperatures were mild averaging 70 degrees F (21 C) and fairly windy. The camping trip (2 nights) was also near Myrtle Beach on private land. The weather was cold with daytime temperatures of 45 F (7 C) and very rainy and windy. I really like how tough this bag is. I feel like I can abuse it and it won't puncture. I shoved it inside my kayak as well as shock corded it onto the back of my kayak. I also stuffed with a lot of stuff: my stove, food, fuel bottle. It worked very well. I also tried to sink it and when I closed it with air inside, it would not submerge. That is a great thing for kayaking! I also really like the lash loops on the sides of the bag. They really make this bag much more versatile than a bag that I can only attach with its closure at the top. I wish it was a little bigger for kayaking because I could not use it as just an equipment bag because it was too small. I couldn't use it just as a food bag because it was too big and when packing a kayak, I don't want to waste space. So I was a little afraid of putting equipment and food in it. I was afraid that the equipment would puncture the food. On the camping trip I used it for two purposes. First, I used it as a safety wallet in my backpack. I put my camera, wallet, phone, etc in it along with underwear and socks (I have got to have dry underwear and socks!). It was almost too big for a safety wallet, however. 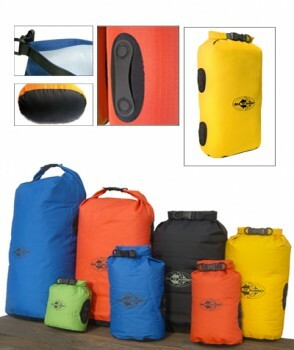 And because the material is so durable, it doesn't squish into a backpack like other dry bags do. The bright color really helped me find it inside the backpack. More importantly, I was able to tie it onto the rain fly of my sleeping hammock to maximize the small space under the rain fly. This weighed down the rain fly in the wind and I wished I'd had two of these bags that I could trust to be waterproof and durable to do that. As the wind blew, and because my hammock was tied to trees, the bag sometimes rubbed up against the tree. Because this bag is so durable, I didn't worry about it puncturing or leaking. Everything stayed nice and dry. I really like this bag and, if it was bigger, it would replace my main dry bag for my kayak trips. At this point I think I might use it more for backpacking or camping in the rain. It is durable and the lash loops on the side make it durable. The size is weird to me, too small to kayak with and almost too big to backpack with. I have used this bag on several bike trips to work and back, one when it was raining. I have used it on three camping trips (6 nights total). Two camping trips were in Myrtle Beach, South Carolina at the Myrtle Beach State Park and the third was on private land near Myrtle Beach. On two trips the weather was clear and mild, mid-70s (24 C) during the day and mid 50s F (13 C) at night. I kayaked with it twice in clear weather, both day trips. I still like how tough this bag is. It is really durable and I'm not afraid that I might puncture it when I shove it behind the seat in my kayak, when I stuff it in my panniers, or when I shove it in my backpack. I really like the lash loops on the side, which makes the bag so much more versatile than one that I can tie only with the closure loop. You can see in the picture of it bungeed to my kayak that the loops are wide enough for a medium bungee to go through. Rope works just as well. My main complaint is the size. For kayaking it is too small for the main bag, but too big for a small bag. I used it either as a day bag for short trips or as cooking/equipment bag for longer trips. For backpacking, it was too small for an equipment bag, but too big for a food bag. Car camping in rainy weather the bag seemed to work well as an extra bag for clothes. It really helped on a downpour day on my bike. 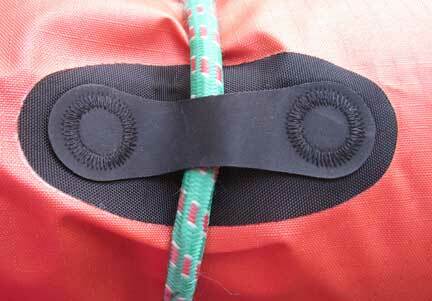 I had two drybags, this one and another that I had previously tested. This one worked great, the other leaked and ruined all my stuff. Unfortunately, I used this bag for my work clothes and the other for my cell, camera, wallet, etc. This bag kept my work clothes nice and dry. This test period, it really never rained when I camped, but I used the bag anyway. It still works well for a weight on the rainfly of my hammock. 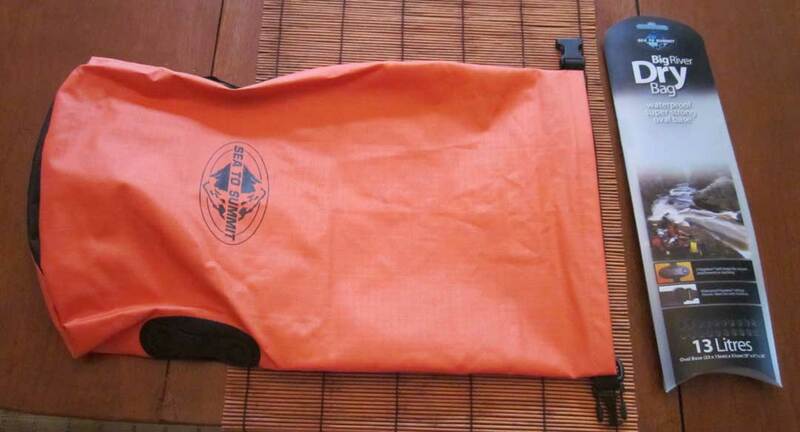 I really like this bag as an extra dry bag for my kayak trips or as my main bag for shorter kayak trips. It is very durable and the lash loops on the sides make it versatile. I also like it for camping with my hammock to use as a weight for the rain fly. As well, I think this might become useful when I travel (overseas especially) because it is so durable and waterproof. I think I will be using this bag for quite awhile. The lash loops on the side make tying it very easy. The size is not as usable as I would like, too small to kayak camp with and almost too big to backpack with. This concludes my long term report. 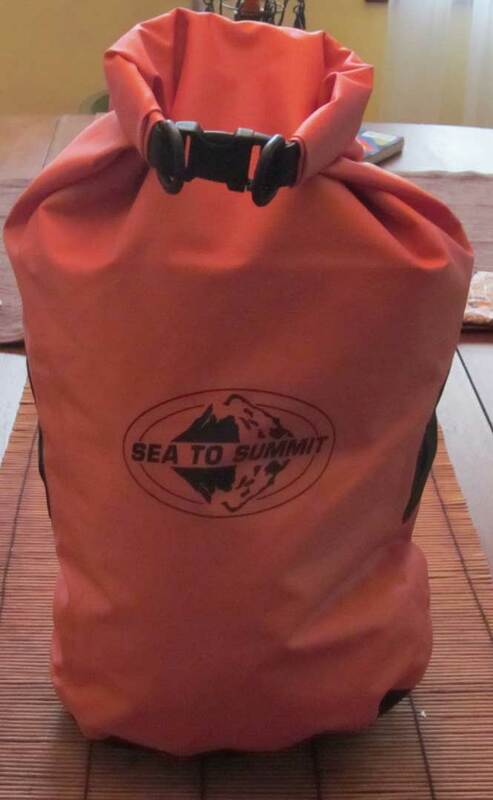 Many thanks to Sea to Summit and BackpackGearTest.org for providing the Big River Dry Bag for testing.